This is exactly what Reb Zalman told me way back in 1984 when I spent my first of many long wild whirlwind days working alongside him: “Gersh,” he said. I remember it so clearly as if it were an hour ago. “Gersh,” he said, as he swerved to miss a double-parked car on a narrow Philadelphia street. “Gersh,” he said, pulling up to the storefront of an optometrist. “Gersh,” he said. “When I die, I want the universe to download me on the cosmic computer as ‘zalman.exe. '” I later learned “exe” was computer lingo back then for “execute,” as in “implement.” It was his dream, his hope, his prayer for as long as I would know him, that what he brought us in his fresh and innovative interpretations of the wisdom of the ancients would continue in its ever-creative unfoldings and not go with him to the grave. Zalman worked night and day building that seemingly impossible bridge, often — very often — compromising his ailing physical embodiment in the process. It was his gift to us, that bridge, that beautiful user-friendly bridge over which we could meander to nurture our souls from a paradigm long lost while we fumbled about in an age that promised utopian hope while delivering apocalyptic befuddlement. They came and took him last week, right from under our noses. They took him back on the Fifth Day of the Hebrew Moon of Tamuz, which happens to be the very same date that Ezekiel the Prophet, some 2,400 years earlier, received his very first vision, the famous vision of the Merkava, the Heavenly Carrier of the Divine Intent and the angelic forces behind its ever-unfolding mystery. It was no accident that Zalman left us on that very same day. He was no less a visionary himself, no less a seer. Reb Zalman, you see, was one of the last of the Keepers. He was an ardent Keeper of the richness of the world we left behind when we crossed over the chasm from near-annihilation to renewed restoration following the Holocaust. Certainly, many elders brought that richness with them, all those old guys with the graying beards, some with numbers tattooed on their arms. They still had it, and they brought it with them across the great abyss, and they tried to hand it over to us but we — emerging from the womb of a brave new world — couldn’t understand their language, and so we left them to the shtetls of Brooklyn and Jerusalem and went after the younger breed and the seeming purity of their vernacular. After all, unlike the old ones, the new ones had not been tainted by the stains of man’s inhumanity to man. They brought us a whole new Judaism, absent the heavily bandaged attributes of the old ones, absent the stench of smokestacks. We needed the joy and the hope that only the new ones could muster for us. But it wasn’t too long before many began to feel the emptiness that the new ones could not fill; the richness was still only in the hands of the older ones, the ones admired from afar but who seemed unapproachable. And so many became disenchanted, and some dropped out altogether. And yet others bee-lined it for ashrams to sit at the feet of young Yogis, middle-aged Roshis and aging Swamis. Then they came. Those two old guys from the other side of the chasm. 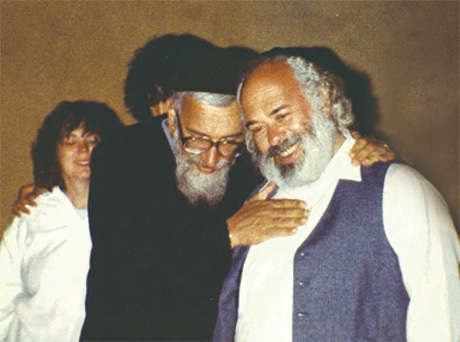 Shlomo Carlebach and his colleague Zalman Meshulam Schachter, two yeshiva boys from the old school who sensed the thirst and responded to a growing generation of disenfranchised Jews and an ebbing Judaism. They saw how the transplant wasn’t taking. They recognized how the Oriental body of Judaism resisted its Occidental transplant. Daringly, they stepped into the new but with only one foot, whilst the other remained firmly entrenched in the old. And it came to pass that Zalman said to Shlomo: “You reach for the heart and I’ll tackle the mind.” And so it was. From campus to campus, from Rainbow Gathering to Rainbow Gathering, these two tricksters of the old world spun their magic in and around ever-increasing crowds, watering the flock of Israel once again, this one singing to parched hearts, this one speaking to emaciated minds, both gifting their songs and their teachings, their stories and their music, deep deep deep within and beyond the hearts and souls of hundreds, then thousands, then tens of thousands, then hundreds of thousands. Until one could no longer keep count and it didn’t matter. And of course so many of the new ones tried to emulate the two old guys, strumming guitars, kvetching out like tunes, imitating teaching styles, telling stories, but you know and I know and we know that there never again arose anyone quite like either of them. And when Shlomo left us, somehow we were still hopeful, because Zalman was still here. And he told us the stories and taught us the songs and moved us to davening and opened our hearts and challenged our minds and fostered ample leverage for the continuity of our renewal. And of course, we thought, we presumed, we hoped, Zalman would never leave us. He went on and on and on in spite of surgeries and hospitalizations and weaknesses and recurring health problems. He had eventually moved to the pristine air of Boulder, invested in a juicer, married, and his wonderful Eve, started taking so much better care of himself that undoubtedly he was going to outlive us all. And so, when he didn’t — outlive us — we were shocked. We are shocked. The last of the old guys who knew our language, is gone, and the bridge is shaky, because — I need to say this — even though Zalman knew our language, I doubt if most of us really knew his. His calls were frequent and continued throughout the years, mostly to touch base with how I was doing, could I send him the source for this or that or the other, what was I working on, what was Miriam working on, how was Miriam, the children, the grandchildren, my health, my finances, etc. As one who was raised and ordained in the traditional yeshiva world, I was awed not so much by Reb Zalman’s capacity to quote verbatim the ancient source texts of Midrash, Talmud and Kabbalah — that was to be expected of any rebbe — but of his uncanny capacity to hold mountains of worldly wisdom as well, and his unique skill in the rare art of articulating both in ways that spoke to the novice no less than to the learned, and to non-Jewish audiences no less than to Jewish ones. As we approach Yom Kippur 5775, I am reminded of the last time Miriam and I saw Reb Zalman in person and the warm loving hug that he gave to us both. It was on Yom Kippur 5774 (fall of 2013). Posted in Reb Zalman and tagged eulogy, Rabbi Gershon Winkler, Rabbi Shlomo Carlebach. Bookmark the permalink.